Please leave comments as the site becomes fully established. You can also visit and join as a member of our Facebook page. Click the Facebook “f” below. In June 1960 Hank B Marvin, Bruce Welch, Jet Harris and Tony Meehan recorded Apache. This charted in July and became the monster hit that launched the Shadows instrumental career and founded a nation of bespectacled guitarists dreaming of acquiring their very own Fender Stratocaster and stepping out into the glaring spotlight of stardom. With their immaculate appearance, synchronised dance movements and clean, pure melodic sound, the Shadows chalked up 35 hits of their own (not counting another 33 hits with Cliff Richard), giving them more hits than any other British group and securing them a unique place in the annals of popular music. In the company of Geoff, Keith, Tony, Tim and Binks the audience is taken on a tour of the Shadows career, with plenty of humour to make it a night out to remember. For anyone who loves the sounds of the 60’s – and enjoys a few laughs on the way – Bootleg Shadows perform a unique tribute that has audiences humming the tunes and doing the Shadows famous ‘walk’ long after they have left the theatre. Millions tuned in to hear Geoff and Tony on the Clare Cavanagh show on Radio Bristol in August 2016. Well quite a few did. Listen to the clip below in case you missed it. You’ll hear about Tony’s big horn and find out more about Geoff’s surname than you ever dreamed of knowing. We put in the not so subtle edit in Wonderful Land so you don’t get all of it but it’s in full on our Audio page. Thanks for writing, glad you enjoyed the show, we did to! Great!! Thanks for your comment! Hi boys can you please come down to Cornwall & play sometime? See you at Lakeside on the 25th at Kathy’s Friday eve bash, & can you bring some t shirts & CD’s along as well. Will take your comments on board with Cornwall – we’ll see if there is anywhere that will have us! The Bootleg Shadows are not at Lakeside later in September, but I will be there on the Friday at the Sound Desk , so come over and say hello. Just wanted to say how much we enjoyed the show, loved the music and hope you will return to Weymouth some time in the future, it was great fun. Many thanks for your kind comments – its lovely to get feedback, The Pavilion is a great theatre to play with very helpful Staff and technicians. We enjoyed ourselves too so thanks for coming! A bit late but just to say both my son James and i went along to see The Bootleg Shads for the 1st time at the weymouth pavillion. We enjoyed great music and plenty of humour and really enjoyed the whole show, being entertained from start to finish. All the guys played great and it really came across how much they were enjoying being on the stage , particular mention to Geoff who played excellently, with a great sound to boot, Bob did a great job with the sound as always. If you havent see the band yet i thoroughly recommend you pop along and have a listen, you wont be disappointed, keep it up guys. Great to see Neil and his friend all the way from Australia, they have see both recent shows and had said to Keith they planned their trip to the UK around our Theatre dates. That is amazing, thanks a lot for coming along and saying hello. That would be great wouldn’t it? We’ve had a look at the Theatre and its big, probably too big for us. Thanks for you message though, if there are any smaller venues you know of get in touch. Greetings Geoff,, There are 2 smaller theatres that have come to mind and they are The Lowther Pavilion at Royal Lytham St Annes Tel 01253794221 ,,,or/and Oswaldtwistle theatre (Nr Accrington ) Tel 01254398319 hope these are ok to give a try Geoff,,ps sat or sun better for me cos I work for Royal Mail ,,thanks again Tony. Thanks for your support. We appreciate it. Would like to thank you all for a fabulous evening and thanks to Tony for coming and having a photo taken with our disabled son Matthew. Hope to see you again and will bring more friends next time. Thanks for your support. We had a good night and always happy to meet and chat afterwards. Thanks. Played Exmouth a couple of times to small crowds so we’ll bear that one in mind. Hello, have you thought about playing at the barnfield theatre in Exeter? It’s a great theatre and it would be great to see you guys here! More for Exeter! Are you working together to get us down there? Joe if 18 is your age that makes you about half a century younger than most of our audience and all the more welcome! We had a great time at the Haymarket in Basingstoke last night. Brilliant show and super music. Would see you again any time. Come back soon. We really enjoy playing those tunes and we really appreciate you writing to us! 30th April 2016 The Haymarket, Basingstoke. thanks for a great entertaining evening, really nice to meet and chat with you all. I have a Fender Stratocaster and would value your advice on the type of guitar strings that are best suited to emulate your sound. ( I am sure they are steel) but wondered if there is anything else I should know, like the grade. Glad you enjoyed the show and thanks for taking the trouble to write to us. With the Strat I use Elixir Nanoweb (anti rust) 10-46. They do last a long time keeping their bright tone for ages. In my opinion well worth the extra £ pounds. I was at the Basingstoke show last night with my family and friends. We thoroughly enjoyed the show, not just seeing shadows music played well live but the good humour from the band (despite a couple of technical issues) and visible pleasure they showed in performing together onstage. If you get the chance to see the Bootleg Shadows then go and see them and you won’t be disappointed. I look forward to seeing them again. hi folks, i am in australia, i saw your link on Hit45s.com and thought i would say hi and wish you were doing an aussie tour. have a great time touring. WOW! Thanks for getting in touch, whearabouts in Australia? We listen to Hit45s too it’s a great station. No plans to tour down under just yet but a big Hi from us Bootlegs to you! hi guys, from the triangular island under the mainland the lovely island of Tasmania, And thanks for supporting such a wonderful station as Hit45s.com, Love listening to it every day. Will follow you on Twitter too, will do that in a minute, Keep on Rockin guys, and maybe one day you might venture down to the great place called australia. You guys provided top entertainment tonight at the Palace Theatre, Redditch. Great show and echoed The Shadows music to perfection. Thoroughly enjoyable. Thanks for the message. Much appreciated. Thanks guys for a brilliant show last night at the Palace Theatre in Redditch. Shame on those people who were dressed as empty seats! They missed a fabulous, professional and hugely entertaining evening. Hope to see you again. Thanks for the message Alan. Shame indeed on those empty seat people. We had one gig sold out recently but we’ll start bringing a few cardboard cut-outs in future, just in case. I saw you at Camberly on 2nd July. I was in my wheelchair in the front row with my husband. My dancing days are over I have Parkinson’s but I shook to your beat. Hi Gill, WOW! Thank you so much for writing to us, we saw you! So glad you enjoyed it…. Even our singing….. HA HA. We had a great night, at the Hayling British Legion. Wonderful music from the Bootleg Shadows , they done themselves proud. With a lot of laughs along the way. The Bootleg Shadows, are Happy to talk to people before and after the show. Nice to see them let Tim, do a drum solo. who really went to town on the drums. My wife as just said ,they are the best band she as seen. If you get the chance . please go and see them. you will have good time. Chris Jenny and Neil. Nice to meet all of you and have a chat. We enjoyed playing at The RBL near the Sea!Glad you enjoyed the show. Tim loves playing those Drums! See you again sometime no doubt! Sadly. Derrick who compared the show on saturday night at the Hayling Legion. passed away., Early Sunday morning. There are details and comments on their Facebook page. hope you don’t mind me mention it to you. Really sorry to hear this! Had known him for a while, I know he will be sadly missed. Great Fish and Chips as well!! Great show last night as ever. Sound problem at start proved to everyone you were totally live. Look forward to seeing you again. Oh yes, always live, we will be back in 2017 so will see you then! great show in Redditch. a few months ago. your far better than Into the shadows. when are you coming back to the West Midlands ? Your comments are much appreciated. Didn’t get many people there but we’ll try to get something in for 2017. Three of the five of us are Midlands-based so fingers crossed. Have you ever come to norfolk (Dereham actually) it is my husbands 65th birthday on 15th August but was wondering if u could surprise him on the Saturday 12th he would be in his element and wow could you imagine his face when you started playing ? Just thought I would ask ????? Hi Peter Thanks for the thought we have not tried that one, it may be a bit big for us at 820 Capacity but I know some acts do not use the Balcony. We will investigate. ( Including Apache of course ).. Nothing at the moment but we are looking at venues so watch this space. Nothing at the moment but we’re looking at potential venues in the northern half of the country so watch this space. Thanks. Should be back March/April next year. Details to be sorted. Saw you last night, 13th April at The Guidhall, Derby and must say we had a fantastic night. I was brought up listening to Cliff and The Shadows and must say you did them proud. Thanks for a fab tie. Hopefully you will be back. Thanks. Hopefully next year after the sell out on Thursday. Thanks Michael. Sounds like you came back for more punishment! We really appreciate your support. Attended your show in Weymouth this evening and throughly enjoyed it. Pity the theatre was only about half full and hope that doesn’t stop you returning sometime in the future. I reckon you would do great on cruise ships or as one of the acts in the 60’s Solid Gold Tours. It’s a big theatre so we’re not disappointed by the crowd of nearly 200. Tickets going well for Wimborne on the 26th too. We’re always open to suggestions on new venues. Thanks for the feedback. Fantastic show at Weymouth tonight took me back to my youth, great playing nice bunch of players fun to watch lead guitar ace wish I could play half as good (been trying for a year) would go and see again anytime one of the best shows I have seen for a long time thank you all for a great night. Geoff is very trying too. He’s got several decades on you so stick at it. Thanks for the nice comments. Thanks for the comments. We don’t get up north very often but we have got Cleethorpes lined up next June, not yet definite. We’ll have a look at Rotherham too. Really enjoyed your gig at Weymouth a couple of weeks ago. website details to the Buttonpop organisers (as promised). Hope you can arrange a gig here among the tulips ! A long time since we played Netherlands and we’ve certainly never played among tulips before. Thanks for supporting us and sending your comments. Many thanks for a great nights entertainment at Wimbourne last night. You a truely an amazing group …will definitely come and see you again . Thank you for writing in Colin & Tina. See you next year! Great evening at Wimborne last night. No false starts like last Year. All the usual hits plus one or two Cliff songs. The only comment I would make was on the bright white lights pointing at the audience. I noticed quite a few people were shading their eyes. In the end I closed mine when they were on. I could still here the wonderful music though. Well, what can I say?! We arrived in Crawley as Bootleg virgins and went home wanting more….much more!! What a great night’s entertainment. Lovely to meet you guys at the end as well. Absolutely splendid!! Ps Geoff is better than Hank!! Always nice to meet our audience and thank you for your support. Geoff is definitely cheaper than Hank and we like him a lot, but Keith likes to point out that the rhythm playing is harder as he has to play all six strings at the same time. Looking forward to seeing you in Swindon on the 14th April, both my husband and I are great fans of the Shadows. My husband does a mean Shadows Walk !!! Hello There!! We are looking forward to seeing you too Marlene – Make sure you stand up and help us out on the last number – Air Guitars provided! Thank you for your comments and for coming to the show. We’ve already booked again for the Palace in Paignton on 13th July 2019. 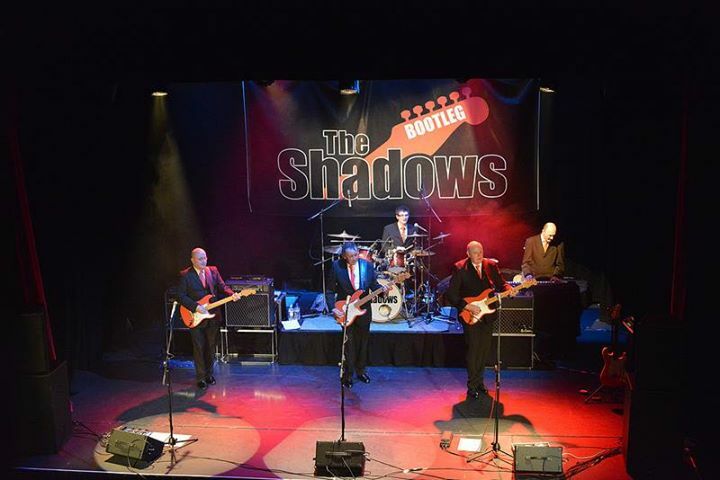 Bootleg shadows…..they are one hell of a band….Paignton palace threate on July 14 was the place to be…quality throughout…great humour , great guys.. Thank you for a great night at Stamford on Sunday Sept9th 2018. You really are very good at what you do. Great idea of including a bit of humour during he performance. Hopefully you will come back next year if possible. Thanks once again for a really enjoyable evening. We enjoyed Stamford – our first time there, we do hope to be back, but if not there somewhere closeby. Thank you for the great comments. We are back in your area at the Oakengates, Telford next November and we’d love to play Market Drayton again soon. Went to see the Bootleg Shadows at the Parkway Cinema, Beverley. A very very enjoyable evening. They are a must to see. Hope to see you again. Glad you enjoyed the show – we did! We could hear you singing along to the Cliff Set – next time up North is Cleethorpes in April if you fancy it? Great to play for our Northern fans. Cleethorpes later this year. Had a great night tonight in Swindon. Full of fun, laughter and great music from very talented musicians. Thanks for a good time. Really enjoyed your show at Cleethorpes Parkway Cinema on the 21st April 2019.First time I have seen you,and I hope it won’t be the last.Five excellent musicians created the great sound of the shadows,with a bit of humour thrown in.Now 70 years old,I have been a fan of the Shadows since my teens,and try to play Shadows music myself on my Fender Stratocaster for my own enjoyment.Thanks for a great show.